Fast and easy to grow automatic strain with a high THC content. One of the most popular automatic strains, Early Girl Autoflowering seeds were created in Spain from a combination of Big Bud, White Widow and Ruderalis genes. Feminized and highly stable, each seed is devoid of any male chromosomes, ensuring every seed generates a high quality female marijuana plant, with automatic flowering abilities. 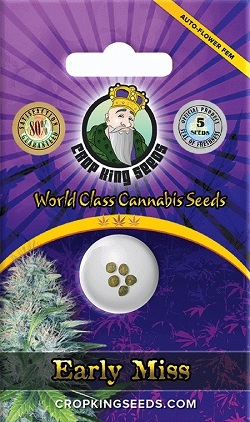 Unlike traditional feminized marijuana seeds, Autoflowering seeds require no set regular hours of darkness to flower and mature, achieving complete ripeness over a period of approximately 7 weeks from sprouting, delivering it’s largest harvests during the height of the Summer, when the daylight hours are at their longest. Early Miss Autoflowering seeds can be cultivated indoors or outside as long as the temperature remains above 10 degrees C. Considered an easy strain to grow, it’s the perfect choice for growers both new and experienced to produce their own high quality marijuana, in one of the shortest times possible. Yields are good, with outdoor growers producing approximately 100 grams of dry, resin laden buds per plant. While indoor growers can enjoy double that amount by controlling the environment better, producing up to 200 grams of high quality buds per plant. For an autoflowering strain, Early Miss produces potent cannabis buds, with THC levels averaging around 20%. CBD levels are also enhanced, 0.7%, as you would expect from the combination of two, popular medicinal cannabis strains, providing relief from stress and tension, as well as being an excellent natural source of pain relief. With changes to the law now allowing adult residents in Canada and many States within the USA to grow their own cannabis and marijuana, Auto seeds are a popular choice for both new and outdoor growers. Requiring little skill or attention, Early Miss Autoflowering seeds will deliver a generous harvest of smooth, creamy buds faster than you thought possible. You can buy Early Miss Autoflowering seeds in feminized packs of 5, 10 and 25 seeds per pack, enjoying big discounts on the larger packets. Enjoy several secure payment options and top quality customer care and service, when you buy Early Miss seeds through us. Click below to learn more or buy Early Miss Autoflowering seeds. Buy Early Miss Autoflowering Seeds today and receive fast discreet shipping to Canada and all US states.